I’m giving a talk in Melbourne, Australia next week on food dyes and am looking for good stories and experiences with food coloring and dyes. 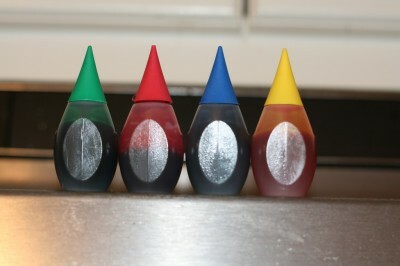 What fun and interesting things have you done with food coloring? Red milk on Halloween? Green eggs and ham for St Patricks Day? Do you have any great uses of natural food colorings? Think beet juice, blueberries, etc. Leave your comments below or use the contact form if you want to keep it private. Thanks! As a kid I used to make cookie dough and keep it in the fridge so I could bake up a few cookies when I got home from school. Problem was I had two brothers who got home before me and ate anything good in the fridge on a daily basis, including my cookie dough stash. I needed a way to “brother proof” my cookies, and came on the idea of using food coloring to make them really unappealing. I started with a nice clear blue–really intense. They ate them. So I thought I had to make the color even less appealing: a mix of all the colors… a sort of poo-y dark greenish-brown… not the nice red-brown of chocolate or cinnamon. And success! My cookie dough was waiting for me after school. Did I mind eating these gross looking cookies… not at all. I enjoyed every bite, and with the knowledge that my brothers had been fooled.